Gyroscope , (Gr. a ring, and to examine), a name applied to various instruments designed to illustrate the phenomena of rotation. 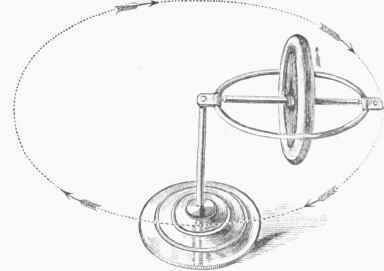 The most curious and generally interesting form of gyroscope, rightly named "mechanical paradox," although its principle was discovered long before its first construction, consists essentially of a disk revolving on pivots within a ring, having on the line of prolongation of its axis, on one side, a bar or spur with a smooth notch beneath to receive the hard smooth point of an upright support. Thus placed, when the disk is not turning, the whole falls, of course, like any heavy body uusupported. Rotate rapidly by unwinding a string, set on the support, but uphold the opposite side of the ring; no peculiar movement then occurs. But if while the disk is rapidly turning, the bar being on the support, the opposite side be set free, the whole, instead of falling, as would be expected, commences a steady revolution in a horizontal circuit about the point of support, moving more rapidly as the primary rotation is expended, and sinking, at first imperceptibly, then more rapidly, until in from one to three minutes it conies to rest. Mathematical analysis shows that when set free, it continually hills and rises, but this motion is not visible. The disk started with its axis in or below the horizontal never rises, without aid, above its first position. Started with high speed above the horizontal, it may rise, and if its connection with the support allow, as when this is by a ball and socket, it may even ascend to a vertical position, and spin as a top. Arrested in its travelling move -ment, it always descends; hastened, it rises. Checked in any part, it inclines in the direction of that part. In the form now given, the travelling or orbital movement is always in the direction in which the bottom of the disk is going. But if the axis be prolonged beyond the support, and the disk and ring slightly overpoised by a weight on the other side, then the disk always travels in the direction in which its top is going, and nearly all the phenomena are reversed. Many other curious results may be obtained; it will here be added further only that the disk below the horizontal is always, and above it usually, slowly falling; and that the orbital motion invariably takes place toward that side of the disk in which the force of the rotation about its own axis is most resisted or checked. For proof of this latter principle, let any small wheel be rotated, and while turning rub or seize it upon any side; the rotation in this side being thus checked, and actually or in effect subtracted from, that in the opposite side preponderates, and the wheel is urged toward the side in which the checking occurs. - Perhaps no completely satisfactory explanation of the phenomena can be given without employing the language and processes of the higher mathematics. This has been done in a very complete manner by Gen. J. G. Barnard in a paper published in the " American Journal of Education " for June, 1857, and also published separately under the title "Analysis of Rotary Motion as applied to the Gyroscope " (New York, 1857). The following explanation proposed by Dr. Levi Reuben of New York is perhaps as satisfactory as it is possible to give without the aid of mathematics. There are two facts to be explained : support, and orbital movement, or travelling about the supporting point. For the first, suppose the disk composed of 1,000 equally heavy particles. When it is set rotating and released, each of these particles is, as a separate ball, acted on by two moving forces, that giving the rotation, and that of gravity; but the whole is also held together by the constraining action of cohesion. Suppose that, when released, the axis points below the horizontal: gravity acts in vertical lines and equally on all the particles. Its direction and amount may be represented by equal short pendent threads dropping down from all the particles. If the particles be also supposed in a single plane, the extremities will all lie in a new plane, slightly without and below the plane of the disk, and parallel with it. The forces impressed in giving rotation upon the several particles of the disk will all point in its plane, being represented at any moment by tangents to the circles in which the several particles move, pointing in all directions, and varying in length from the axis, where this is zero, to the periphery, where it is a maximum. But the resultant movements or tendencies of the particles must all terminate in the exact plane in which the gravitative components were seen to terminate. Every particle thus acted upon, then, tends to go outward or forward into the new plane already referred to. The several pressures are to points scattered somewhat widely in that plane; but owing to the cohesion of all the particles, they are constrained to move or press forward in a body. The effect is as if the whole disk were pulled outward and very slightly downward, while the pivot in the notch reacts or pulls in the opposite direction; and the wheel is supported, in part, as if slung up by strings attached to its two faces and pulled in opposite directions. When the disk is above the horizontal, the new plane is behind or within it; it then pushes against the pivot, and this reacting, there occurs support by opposite pressures, instead of tractions. Thus we discover one reason why no material support is needed for the remote end of the axis; while as a consequence of this view, if the axis be horizontal it must first sink slightly, yet it may be only imperceptibly, before support can occur. This agrees entirely with the results of mathematical analysis. In the second place, why does the disk travel around the supporting point? When not overpoised, gravitation acting downward, and rotation, in the ascending side of the disk, upward, the latter is in effect decomposed into a horizontal and a vertical component, the horizontal expressing itself in the pressure already referred to, the vertical being resisted or antagonized by the force of gravity; the result for each particle being the sum which the latter as a negative quantity would form with the former. In the ascending side, therefore, gravity overbalances, equals, or diminishes, according to the place of each particle, the rotative force of ascent acting upon it; but to the vertical component of the rotative force of all the particles in the descending side it adds alike a quantity of action equal to its own amount. Hence, the whole rotative force in the descending half may be considered as increased, that in the ascending as diminished. There will be some point in the ascending half at which the vertical component of rotation equals gravity; this will become in effect a point of rest, or of no action. This is then the point pierced by the resultant axis - the point about which all the particles under the combined forces will tend to revolve: those in the ascending half starting with less radii to sweep round this point as a centre; those in the descending starting with longer radii, and sweeping in longer curves about the same point. Thus the disk is continually carried to the side in which the action is most checked; and this constitutes the travelling movement. When overpoised on the opposite side, the action of gravity on the disk itself is upward, the axis acting as a lever, the support on which it rests as a fulcrum; the rotative force of the descending particles is now resisted by it; and for a like reason the disk now moves toward its descend-ing side. When not overpoised, the travelling movement of the disk itself introduces a new element into the case, by resisting the rotating of particles in the upper half backward in the course of movement. This checks and diminishes the action in the upper half of the disk, and constitutes a new source of support by generating a tendency upward; and it is doubtless this part of the action that raises the disk at times to an erect position. The principles thus arrived at explain also why the disk travels faster as its axial rotation lessens", and also when weights are added to it; why in the ordinary form it rises if its motion is hastened with the hand; why, if overpoised, it descends by being hastened, and rises on being delayed in its orbital movement; and in fact, it may safely be said, every phenomenon which the instrument can be made to present. The same explanation, in effect, applies if the rotating body be a sphere, or of any other form. The facts of support and orbital movement, though separately considered, are really but two different expressions of the same phenomenon; the two actions, here for convenience separated, really conspire in one movement, and that is the composition of a rotation caused by gravity with another imparted by the hand. The reason why the rotating body does not fall is, that in such a body, whenever its plane is oblique to the vertical, gravity is no longer allowed to act singly, but must in every instant enter into composition with another force. Hence the body in such case cannot simply fall, but must move toward such new place in space as the combined actions shall determine; and hence, again, the same force which ordinarily produces a vertical fall, here carries a body round in a horizontal circle, or secondarily sometimes even causes it to ascend. The weight of the rotating disk, however, is in all positions sustained by the support and base on which the apparatus rests. In this explanation, the distance through which the gravitative force acts has been taken as very short, because by experiment and calculation it can be proved that, unless the weight of the ring is very great, the whole downward action of gravity on the disk is very slight compared with that of the rotation first imparted by the hand, sometimes as small as in the ratio of 1 to 40 or GO.